We leave Wednesday for Ohio and ultimately Detroit, MI, to attend the beatification mass of Fr. Solanus Casey on November 18. Two of our littles will be left behind with grandparents, so that causes some anxiety, but it will be okay. We’ve done it before! For those who missed the last post, we have decided to take our son on pilgrimage to this mass to pray for his healing. You can read about that here. It took some searching but I found a prayer for Fr Solanus Casey. A novena to him starts today. A prayer for Fr. 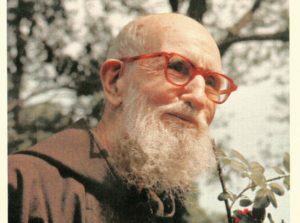 Solanus canonization is a prayer for Peter because we are praying for a miracle. I did not pray for my daughter Celeste to miraculous have a brain or for Peter to be born with a complete lip and palate. I prayed for the strength and peace to accept the will of God for what we will face. My heart has been moved to pray for this. A miracle of healing could be a miracle regarding his genetic mutation, his sodium channels, his oral aversion, his speech, or his heart. He is so young that should God choose to apply his grace to Peter’s life in some way we cannot see, that too is an answer to this prayer. Please consider praying alongside us. If you are not Catholic, perhaps you would consider praying the Lord’s Prayer/Our Father for these days leading up to the mass. If you are not Christian, we are grateful for your well-wishes and kind thoughts. Whatever we can do lift our hearts together. The novena starts today! November 10 – November 18.